Over the last 6 years, we’ve been so blessed to have employees who are not only great friends, but who have truly shaped The National to be the place we love today. This year, we’ve said goodbye to some of our best and well-loved. As they move on to the next phase in their lives, we wish them all the luck they’ve bestowed on us. Emily B Hall has moved to Nashville. She just bought her first house with her longterm boyfriend, and she continues to take gorgeous photographs as always. Besides reviving the classic tintype process, she is also shooting for Amazon! And if you need a great wine recommendation and a little time spent with your favorite sassy waitress, you can catch her at City House. 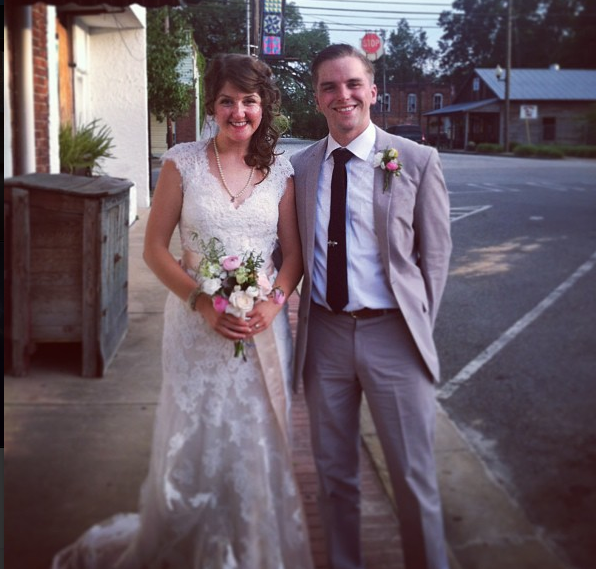 Amy Mitchell and David Frink are hitched! The National’s sweethearts are embarking on a cross-country honeymoon before they settle down in Oxford, Mississippi. Our former sous-chef, David is now managing Volta. Amy will begin Law School at Ole Miss in the fall. She was one of the original servers at The National; we’re so proud! Carrie Laird is taking her sweet techniques to New Orleans! She’s accepted a pastry position at Lilette, where she’ll begin in June. Carrie has been our pastry chef at The National almost as long as the Portuguese custard tart. We love her to death! Matt Allgood is known for his charming good looks, his all black outfits and his love of crudo here as a server at The National. This summer he begins his Physical Therapy degree in Augusta, Ga, where he is moving with his fiance. He’ll be married in December. Nathan Brand is one of our Sous Chefs, a young talent we’re sorry to lose. He just got married this Memorial Day weekend, and they’re moving to Richmond, VA, where his wife is finishing her Phd program. Nathan will be working at The Roosevelt, a great up-and-coming restaurant. Ben DuPriest has cooked a lot of delicious food for The National. We will miss him every year on opening day for the Braves, and especially at Mardi Gras without his gumbo. After receiving his Masters in Musicology, he is continuing his Phd program in Philadelphia at University of Pennsylvania. Coby Large and Aileen Lewis are living in Charleston, SC. Aileen was one of our lovely pastry ladies, and now she’s the Accounting Associate at Garden & Gun Magazine. Coby was a Sous Chef at The National, and now he’s making pops for King of Pops. The lowcountry beach life ain’t so bad. As we say our goodbyes, we are also saying hello to a new group of talented staff, and we can’t wait for you all to meet them too. Luckily at The National we can be certain that the future will always hold great friends brought together by a love of great food. To the next 6 years!